Tehran mayor says the environment is the most important index of quality in villages and cities, the loss of which will be a disaster. 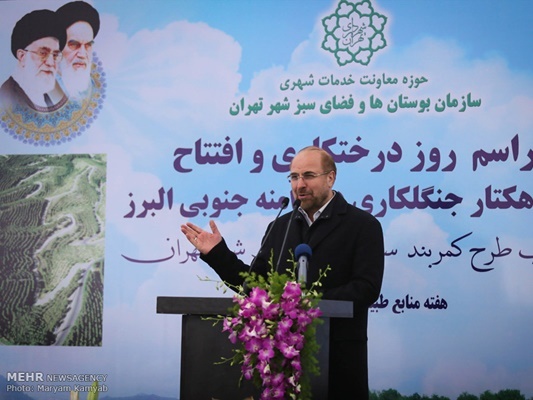 Addressing a ceremony to mark the Week of Natural Resources and inaugurate a 100-hectare afforestation project in the southern foothills of Alborz Mountain range, Qalibaf stressed that everybody is required to endeavour to preserve and expand the country’s forests. Referring to his talks with Iranian Parliament Speaker Ali Larijani on doing the follow ups to minimise Tehran’s air pollution, he said he has repeatedly reminded him that inefficient management in some sectors is the first problem to be resolved to this end. Currently, he added, such ineffective management is expanding its range penetrating into other sectors of the country. Qalibaf noted that Tehran Municipality has done its best to purchase the city’s gardens and turn them into public places such as parks. In only one of Tehran districts, the municipality has spent over $485 million to purchase private gardens and turn them into parks, and this shows the organization’s absolute determination to protect the city’s green spaces, he went on to say. According to a Farsi report by ICANA, speaking in the same ceremony, Larijani said the report presented today by Tehran mayor indicates the municipality’s resolve to solve Tehran’s grave problems. He added creating a green belt in the area surrounding the city was a very effective measure which, providentially, received sufficient attention.